The symbiosis genes of pea. A new allele, stbs, at the St locus. A new ramosus gene on chromosome 5. A second gene for leaf edge necrosis, len-2, located on chromosome 5. Branching in Pisum: inheritance and allelism tests with 17 ramosus mutants. The genetic basis of early flowering in mutant line I/178. Manifestation of the Lf locus in tissue culture of pea. Linkage relationship between genes Fw and Fnw. Linkage of Td with markers on linkage group III of peas. Mapping of the third locus for histone H1 genes in peas. Two waxless mutants of somaclonal origin in pea. Expression of det (determinate) in genotypes Lfd, Lf, lf and lfa. coch and het are allelic. Internode length in Pisum. Interaction of genes lhi, la and crys. Internode length in Pisum. Two further lv mutants. Berdnikov et al (pp 37-39 this issue) conclude that the dominant gene for neoplastic pods, Np, may confer a measure of resistance to pea weevil (Bruchus pisorum L.), a common pest of garden pea. Pods with allele Np form pustule-like outgrowths under certain environmental conditions as a result of proliferation of the epidermal cells (Dodds and Matthews, 1966; Nuttal and Lyall, 1964). 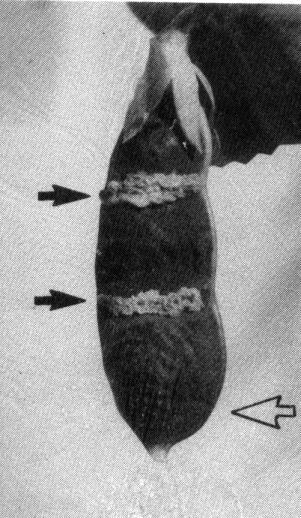 Similar outgrowths also form in response to Bruchus ovipositions (Vasilev, 1939). Berdnikov et al found that 6-8 days after oviposition, these outgrowths underwent necrosis and eventually fell away removing any unhatched eggs. However, the majority of the larvae managed to hatch earlier and penetrate the pods. Thus the strategy appeared not to be a very effective defence. Nevertheless, they found a high concentration of the Np allele among accessions from regions where pressure from the pest was high. The cover photo (Berdnikov et al, Fig. 1) shows a purple pod of genotype Np/np with two bands of white, pustule-like outgrowths formed in response to application, through a glass capillary, of a 0.9% NaCl solution containing the homogenised remains of a Bruchus individual (black arrow). NaCl solution without the Bruchus homogenate (white arrow) failed to evoke this response. Pods lacking the Np allele did not respond to the Bruchus homogenate.